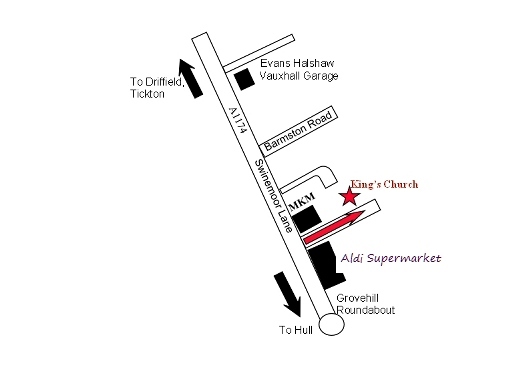 King’s Church Beverley is located in a purpose-built church facility, in Jacob’s Well Yard, next to the Well-One Clinic, off Swinemoor Lane. We are up the road between Aldi supermarket and MKM builders’ merchants. 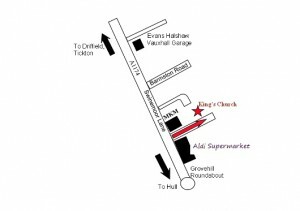 Going from the roundabout between Grovehill Road and Swinemoor lane, go towards “Focus DIY”, and turn right just between Aldi & MKM. Go to the end of the road, through the iron gates, and park on the left. King’s Church is the blue single-story building.